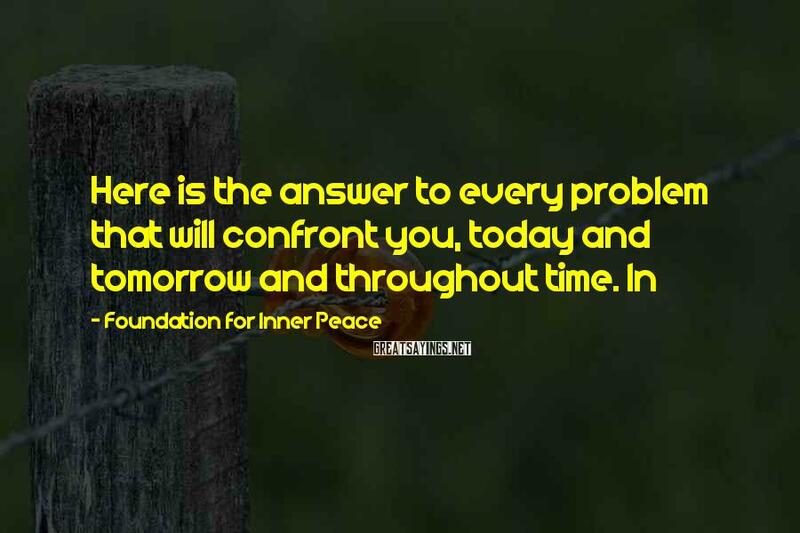 70 Foundation For Inner Peace Famous Sayings, Quotes and Quotation. 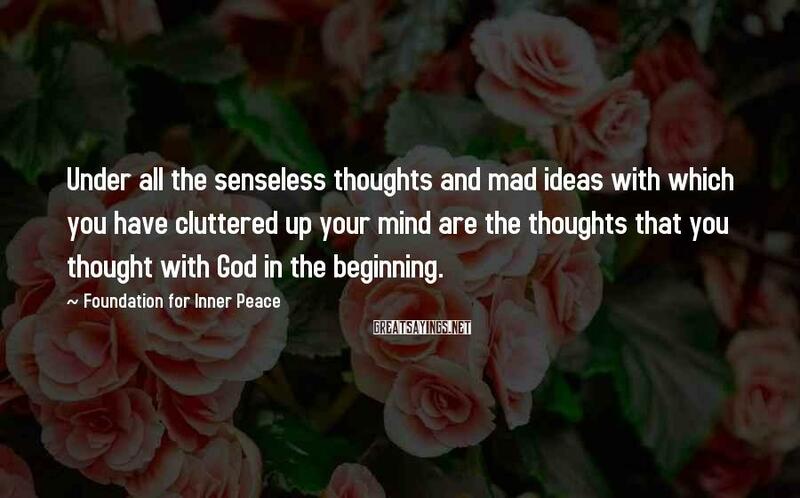 Under all the senseless thoughts and mad ideas with which you have cluttered up your mind are the thoughts that you thought with God in the beginning. T-11.VI.7. 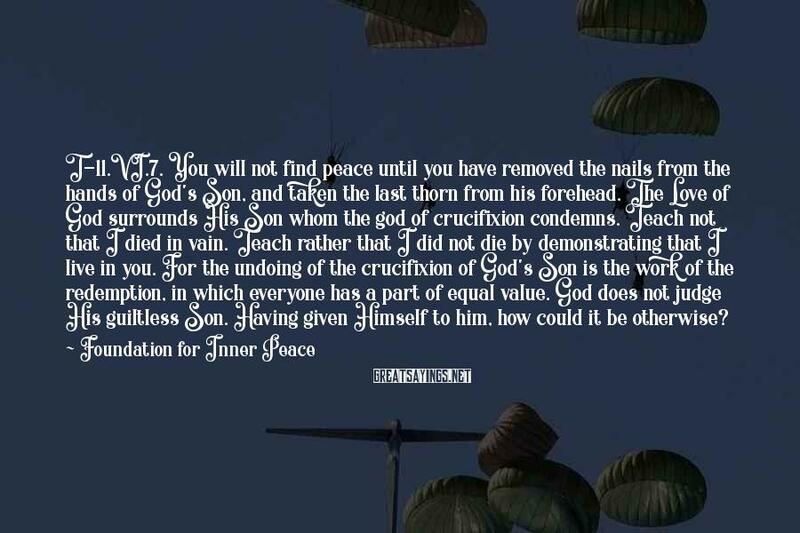 You will not find peace until you have removed the nails from the hands of God's Son, and taken the last thorn from his forehead. The Love of God surrounds His Son whom the god of crucifixion condemns. Teach not that I died in vain. Teach rather that I did not die by demonstrating that I live in you. For the undoing of the crucifixion of God's Son is the work of the redemption, in which everyone has a part of equal value. God does not judge His guiltless Son. Having given Himself to him, how could it be otherwise? The Christ in you is very still. He looks on what He loves, and knows it as Himself. 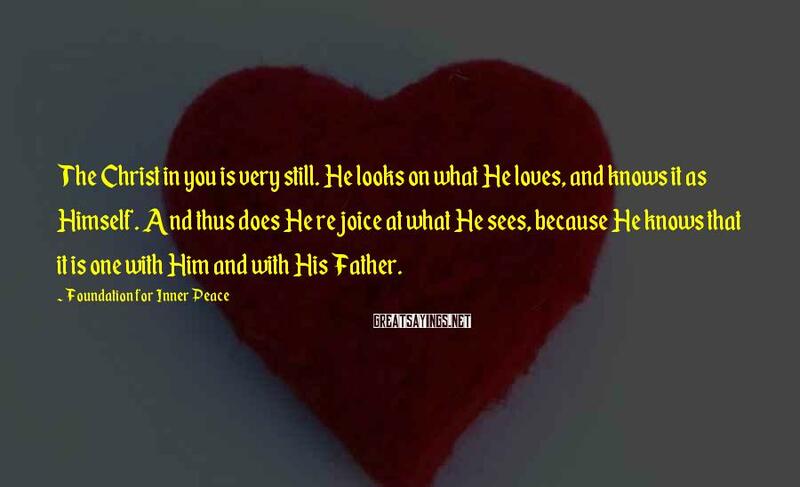 And thus does He rejoice at what He sees, because He knows that it is one with Him and with His Father. 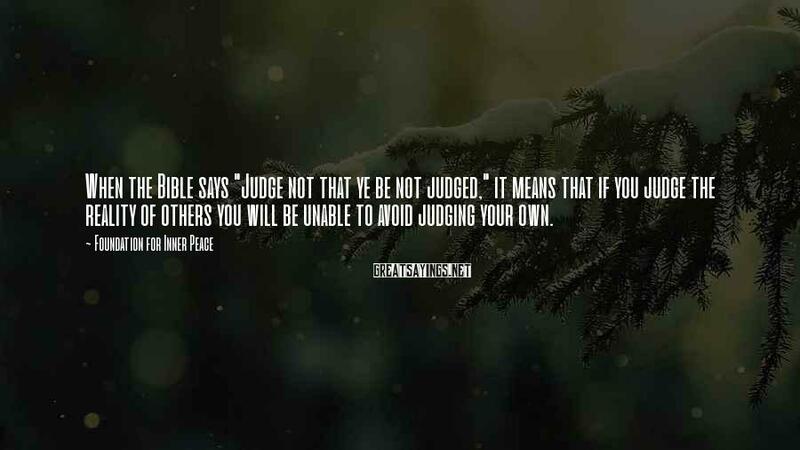 When the Bible says "Judge not that ye be not judged," it means that if you judge the reality of others you will be unable to avoid judging your own. 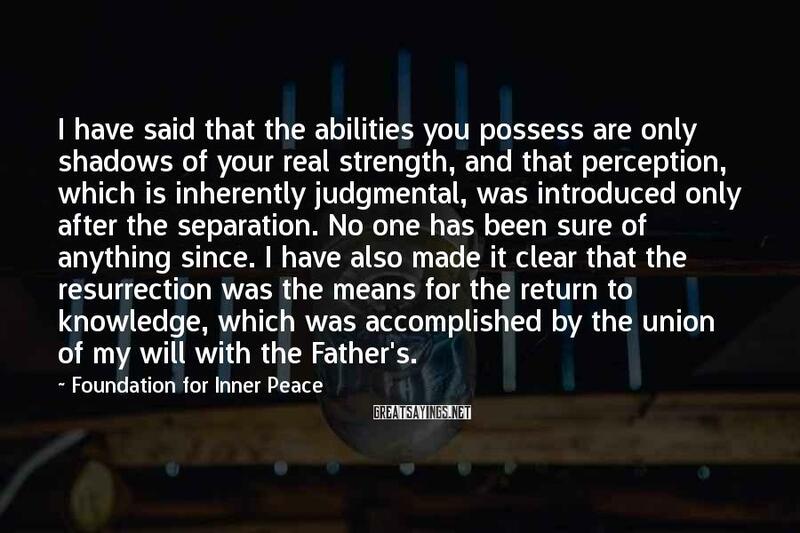 I have said that the abilities you possess are only shadows of your real strength, and that perception, which is inherently judgmental, was introduced only after the separation. No one has been sure of anything since. I have also made it clear that the resurrection was the means for the return to knowledge, which was accomplished by the union of my will with the Father's. 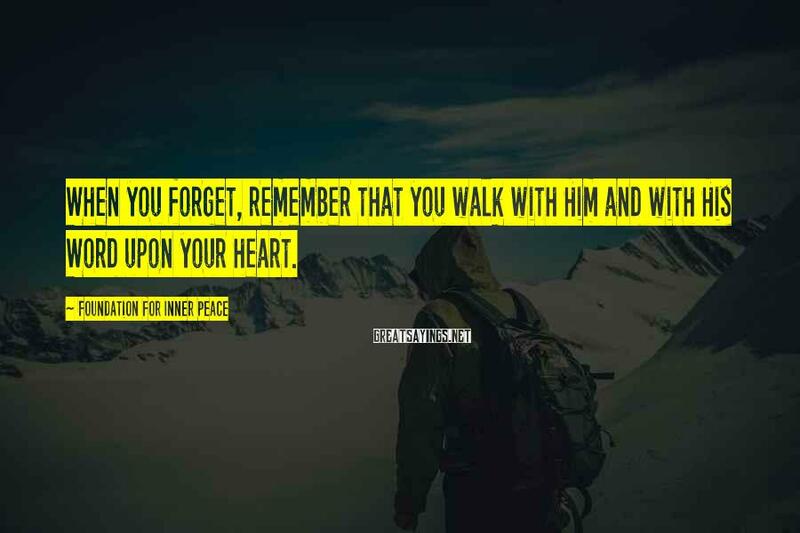 When you forget, remember that you walk with Him and with His Word upon your heart. P-2.in.1. Psychotherapy is a process that changes the view of the self. 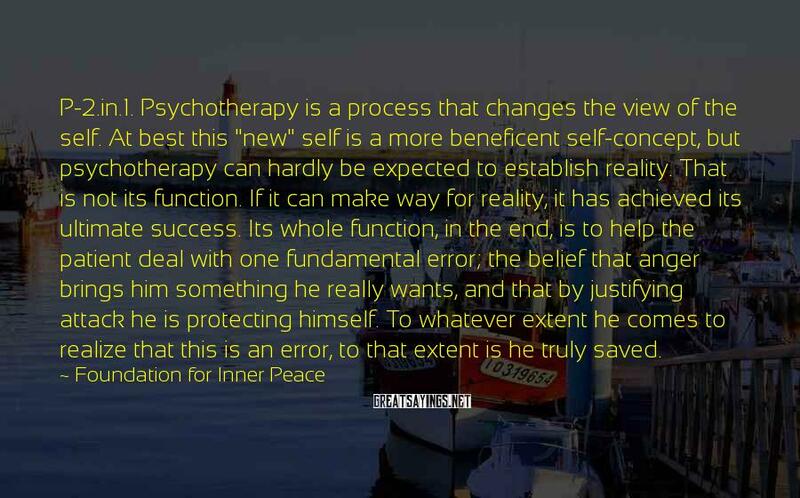 At best this "new" self is a more beneficent self-concept, but psychotherapy can hardly be expected to establish reality. That is not its function. If it can make way for reality, it has achieved its ultimate success. Its whole function, in the end, is to help the patient deal with one fundamental error; the belief that anger brings him something he really wants, and that by justifying attack he is protecting himself. To whatever extent he comes to realize that this is an error, to that extent is he truly saved. 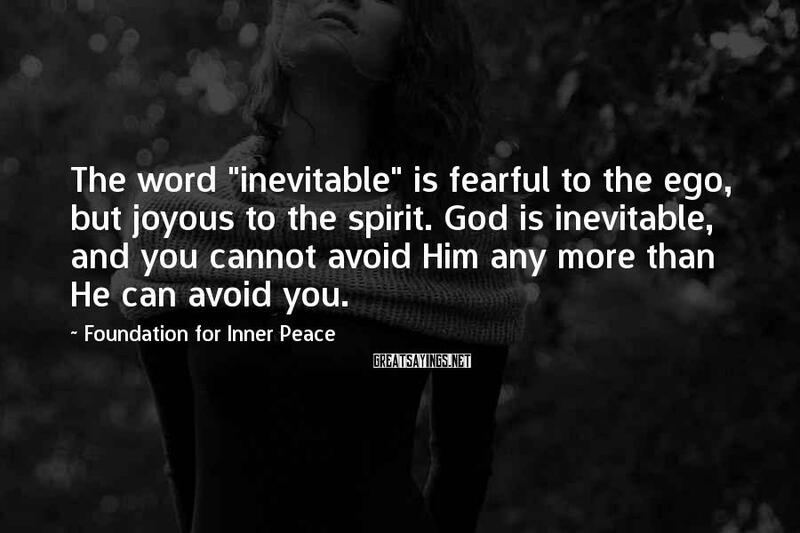 The word "inevitable" is fearful to the ego, but joyous to the spirit. God is inevitable, and you cannot avoid Him any more than He can avoid you. Perfect love casts out fear. 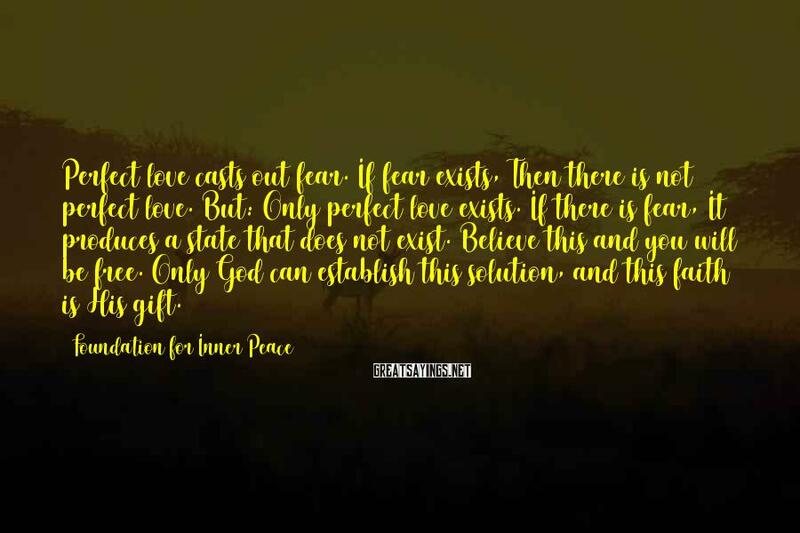 If fear exists, Then there is not perfect love. But: Only perfect love exists. If there is fear, It produces a state that does not exist. 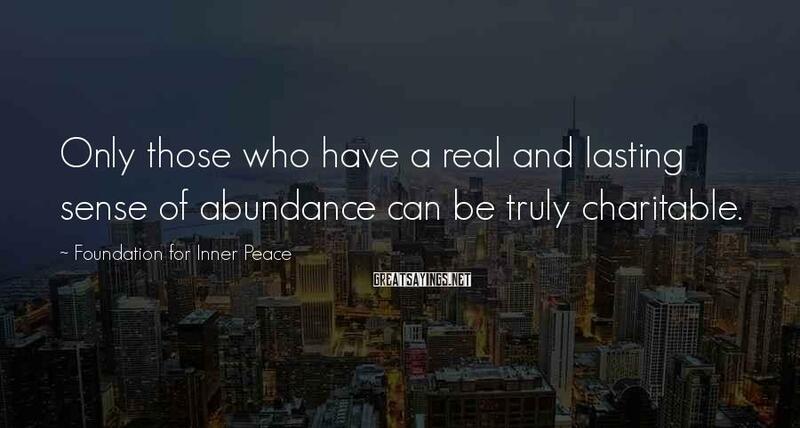 Believe this and you will be free. Only God can establish this solution, and this faith is His gift. 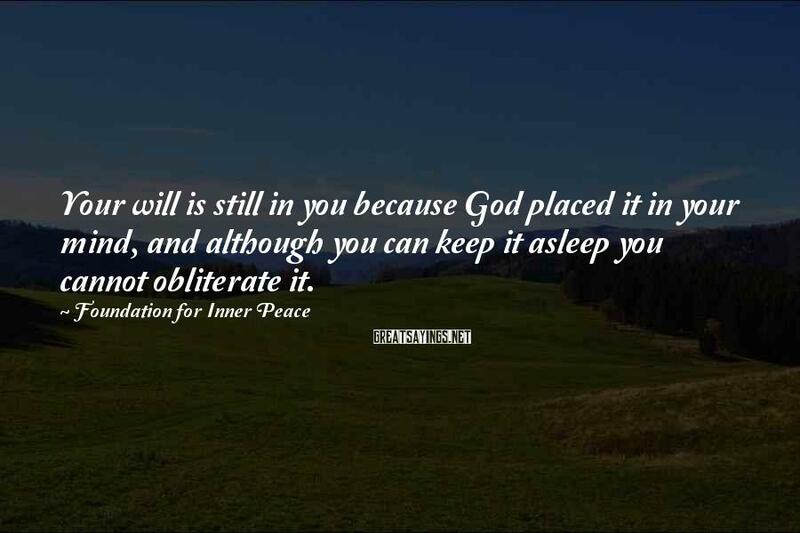 Your will is still in you because God placed it in your mind, and although you can keep it asleep you cannot obliterate it. 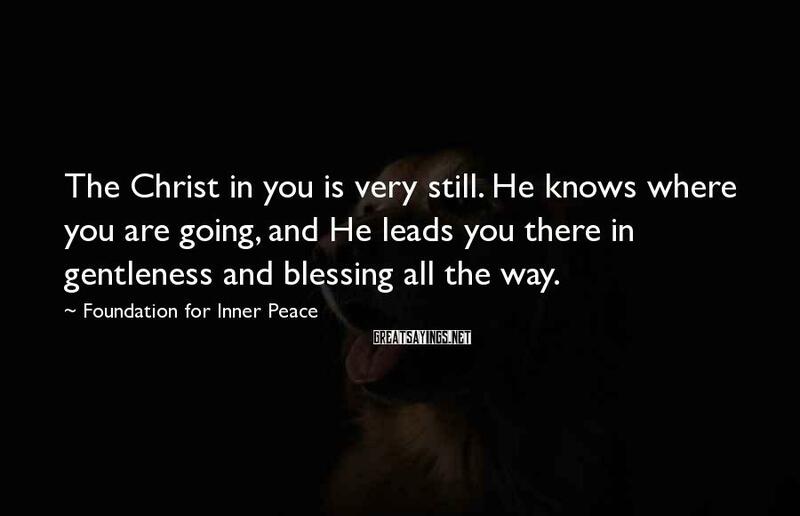 The Christ in you is very still. He knows where you are going, and He leads you there in gentleness and blessing all the way. I can erase all misperceptions from your mind if you will bring it under my guidance. 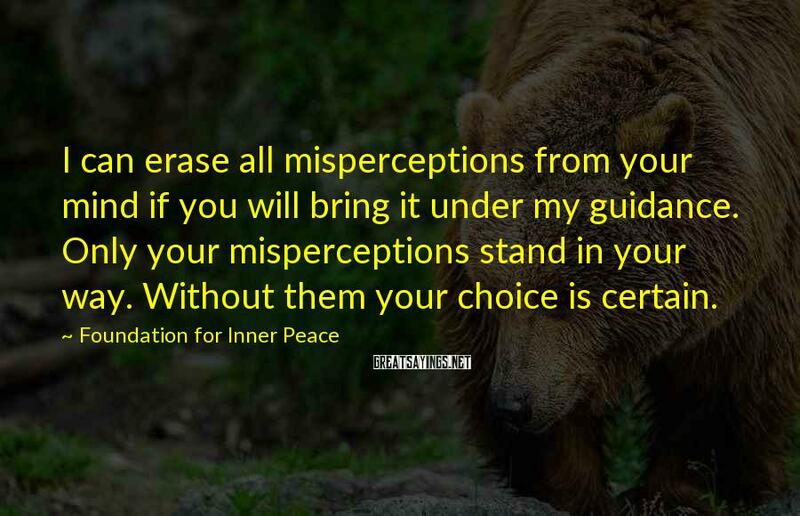 Only your misperceptions stand in your way. Without them your choice is certain. T-4.I.2. 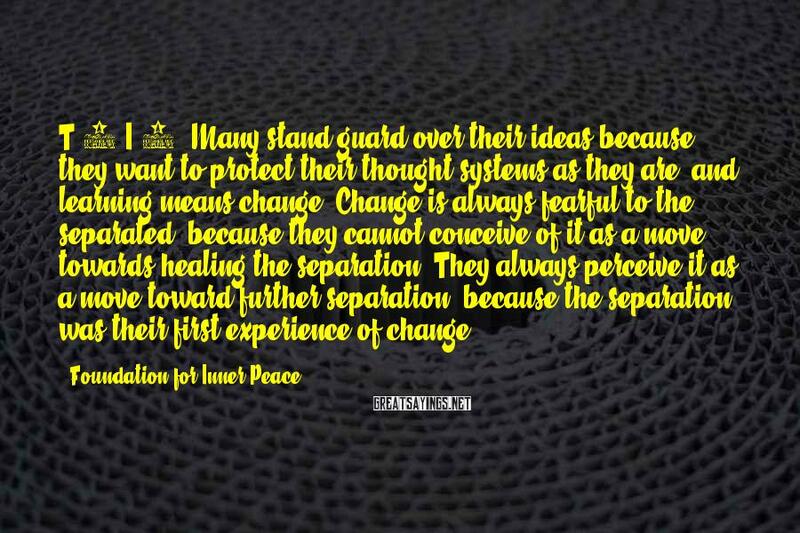 Many stand guard over their ideas because they want to protect their thought systems as they are, and learning means change. Change is always fearful to the separated, because they cannot conceive of it as a move towards healing the separation. They always perceive it as a move toward further separation, because the separation was their first experience of change. T-1.I.19. 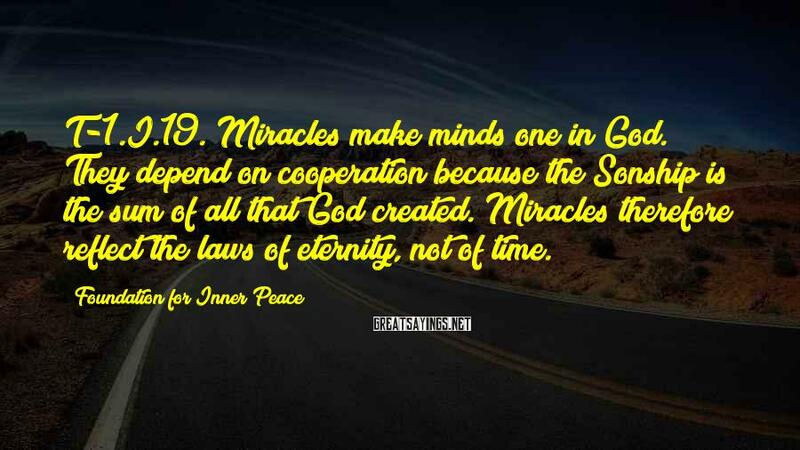 Miracles make minds one in God. They depend on cooperation because the Sonship is the sum of all that God created. Miracles therefore reflect the laws of eternity, not of time. 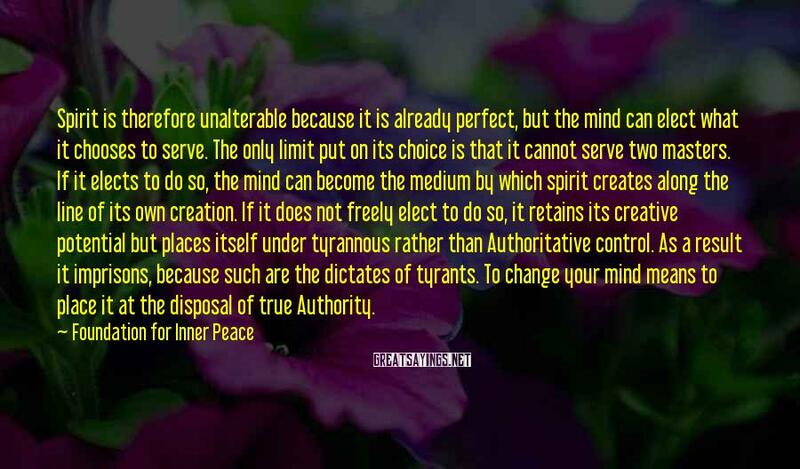 Spirit is therefore unalterable because it is already perfect, but the mind can elect what it chooses to serve. The only limit put on its choice is that it cannot serve two masters. If it elects to do so, the mind can become the medium by which spirit creates along the line of its own creation. If it does not freely elect to do so, it retains its creative potential but places itself under tyrannous rather than Authoritative control. As a result it imprisons, because such are the dictates of tyrants. To change your mind means to place it at the disposal of true Authority. Children perceive frightening ghosts and monsters and dragons and they are terrified. 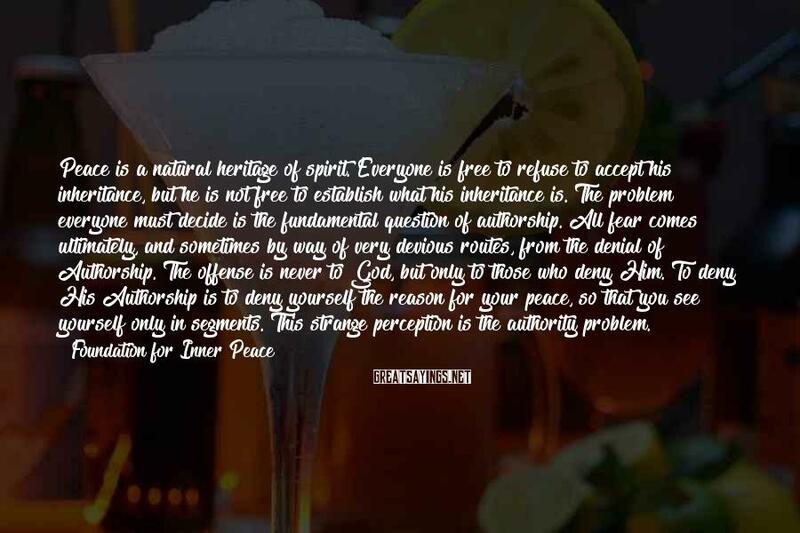 Yet if they ask someone they trust for the meaning of what they perceive, and are willing to let their own interpretations go in favor of reality, their fear goes with them. 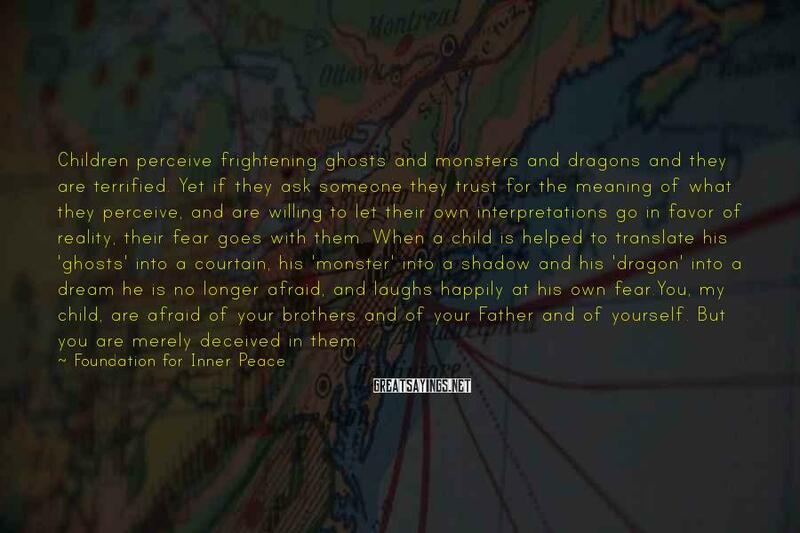 When a child is helped to translate his 'ghosts' into a courtain, his 'monster' into a shadow and his 'dragon' into a dream he is no longer afraid, and laughs happily at his own fear. You, my child, are afraid of your brothers and of your Father and of yourself. But you are merely deceived in them. Ask what they are of the Teacher of reality, and hearing His answer, you too will laugh at your fears and replace them with peace. For fear lies not in reality, but in the minds of children who do not understand reality. It is only their lack of understanding that frightens them, and when they learn to perceive truly they are not afraid. Prayer is the medium of miracles. 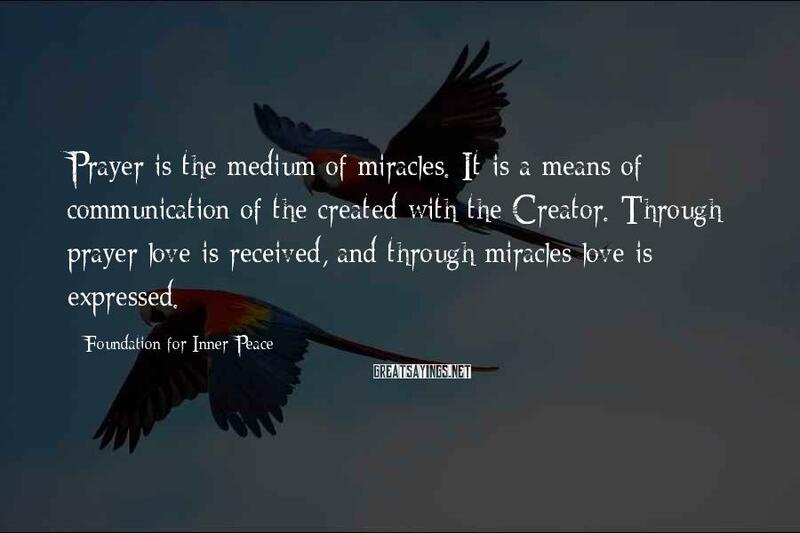 It is a means of communication of the created with the Creator. Through prayer love is received, and through miracles love is expressed. Forgiveness offers everything I want. 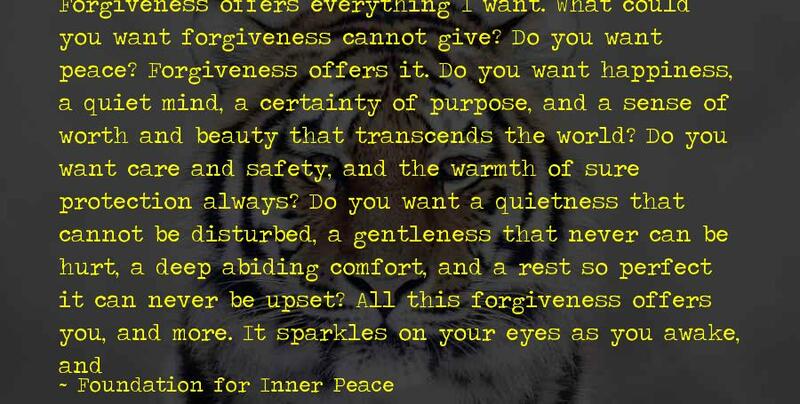 What could you want forgiveness cannot give? 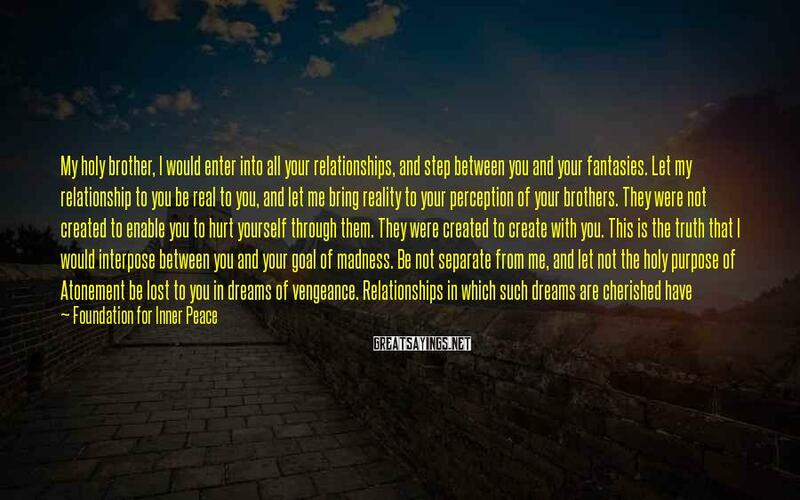 Do you want peace? Forgiveness offers it. Do you want happiness, a quiet mind, a certainty of purpose, and a sense of worth and beauty that transcends the world? Do you want care and safety, and the warmth of sure protection always? 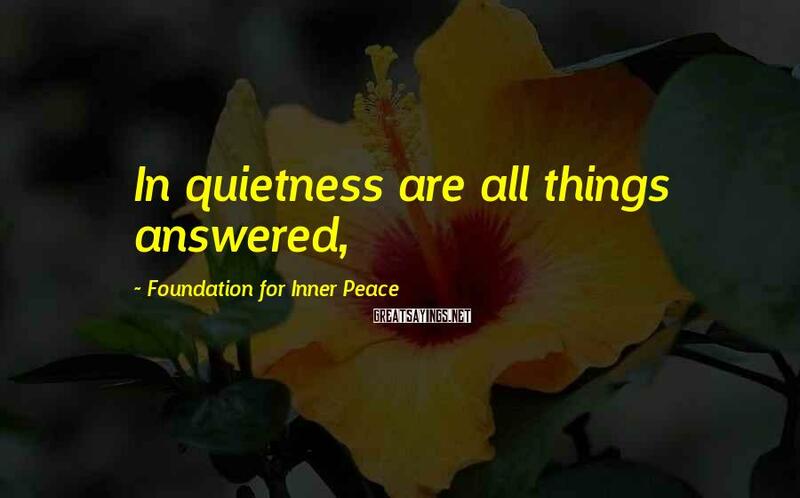 Do you want a quietness that cannot be disturbed, a gentleness that never can be hurt, a deep abiding comfort, and a rest so perfect it can never be upset? All this forgiveness offers you, and more. It sparkles on your eyes as you awake, and gives you joy with which to meet the day. It soothes your forehead while you sleep, and rests upon your eyelids so you see no dreams of fear and evil, malice and attack. And when you wake again, it offers you another day of happiness and peace. 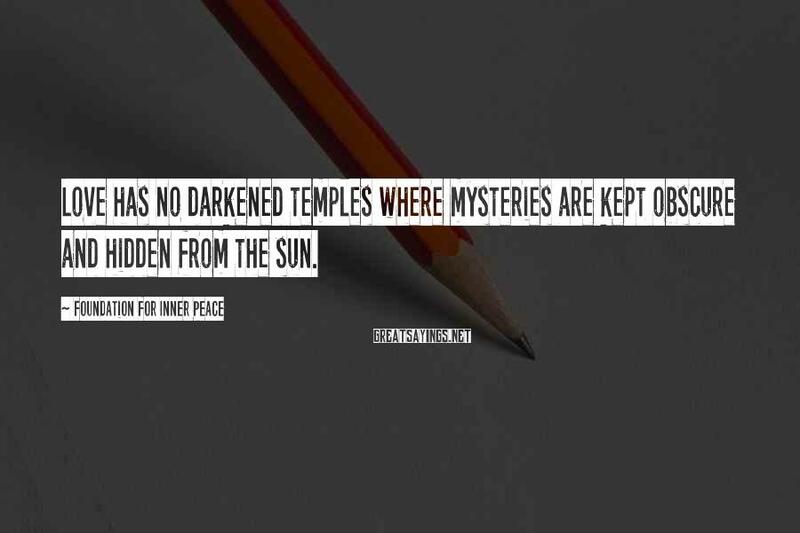 Love has no darkened temples where mysteries are kept obscure and hidden from the sun. 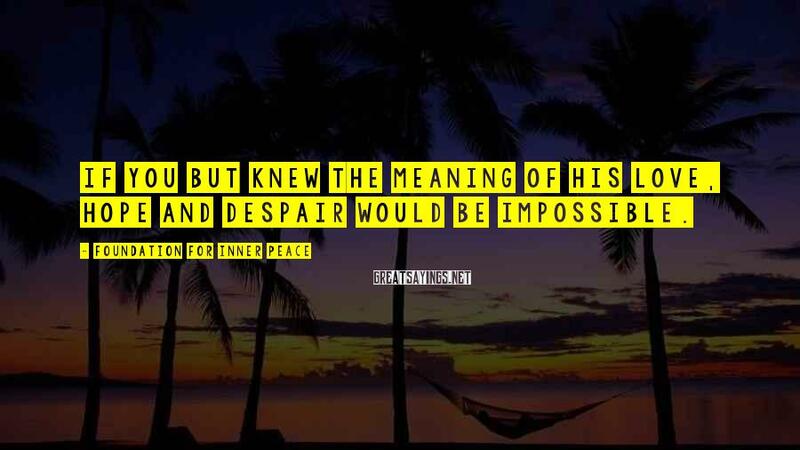 If you but knew the meaning of His Love, hope and despair would be impossible. Miracles enable you to heal the sick and raise the dead because you made sickness and death yourself, and can therefore abolish both. 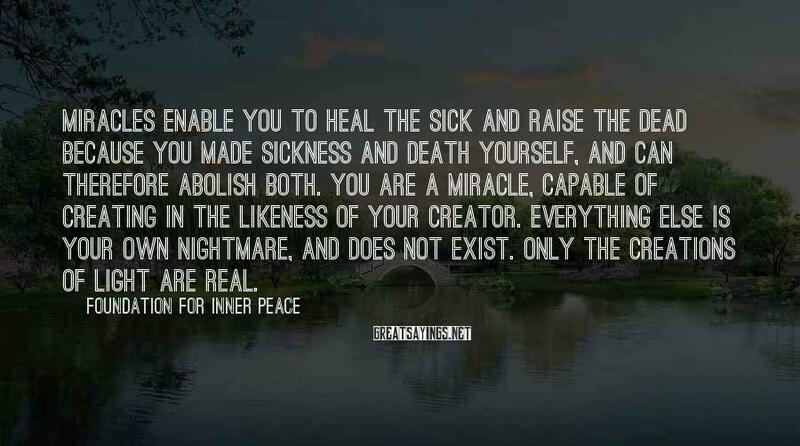 You are a miracle, capable of creating in the likeness of your Creator. Everything else is your own nightmare, and does not exist. Only the creations of light are real. 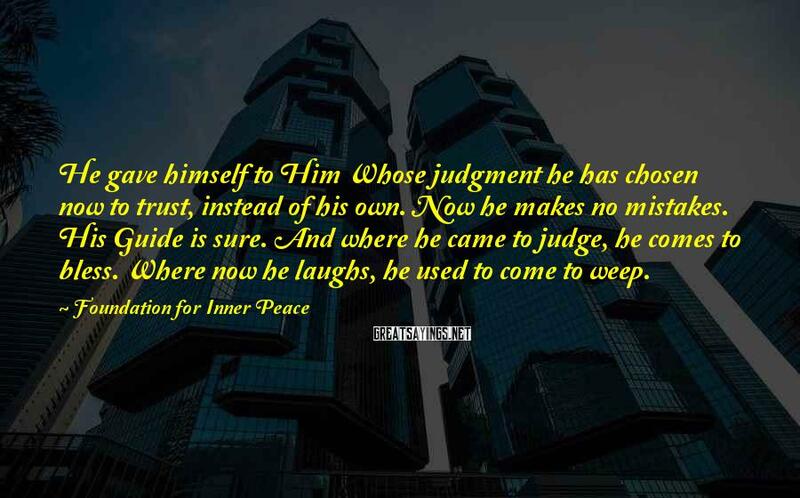 He gave himself to Him Whose judgment he has chosen now to trust, instead of his own. Now he makes no mistakes. His Guide is sure. And where he came to judge, he comes to bless. Where now he laughs, he used to come to weep. 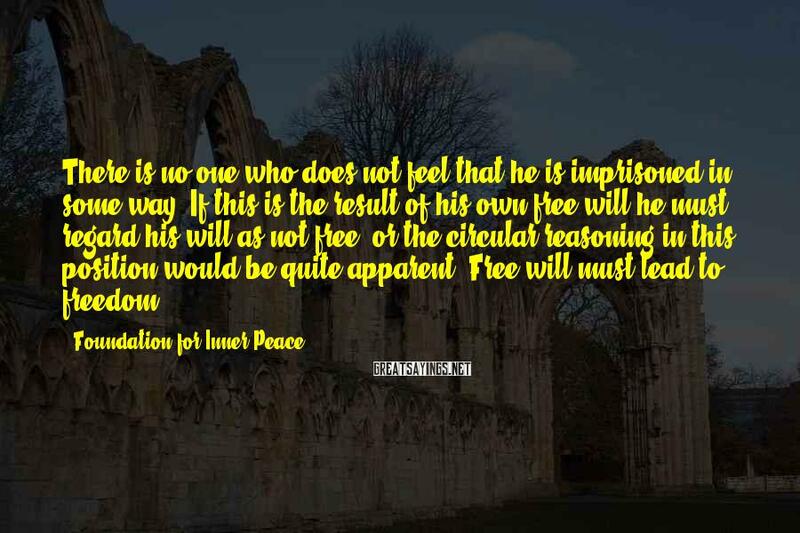 There is no one who does not feel that he is imprisoned in some way. If this is the result of his own free will he must regard his will as not free, or the circular reasoning in this position would be quite apparent. Free will must lead to freedom. 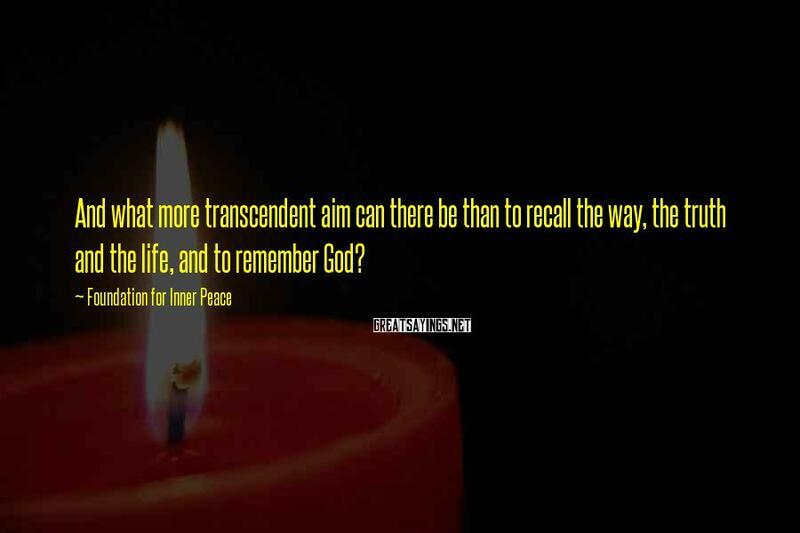 And what more transcendent aim can there be than to recall the way, the truth and the life, and to remember God? Everyone seeks for love as you do, but knows it not unless he joins with you in seeking it. 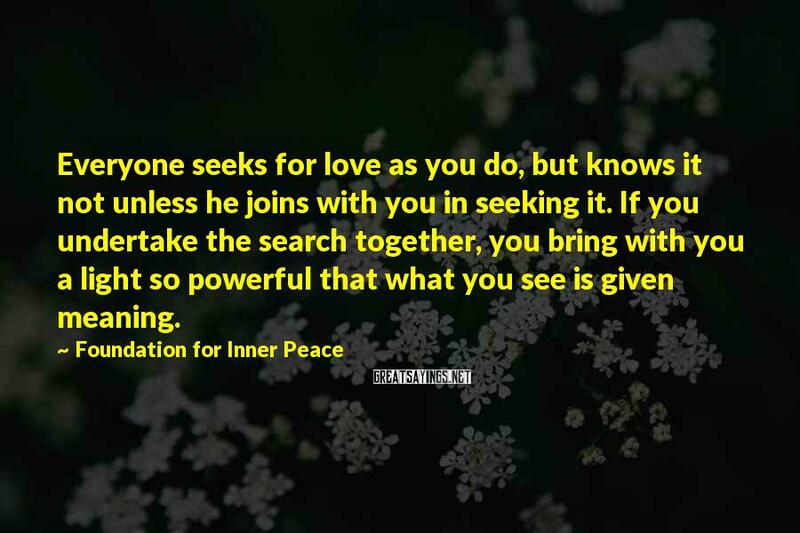 If you undertake the search together, you bring with you a light so powerful that what you see is given meaning. 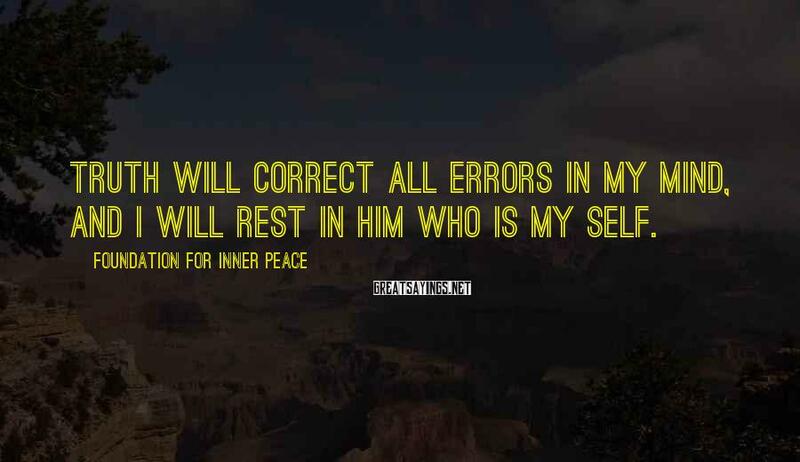 Truth will correct all errors in my mind, And I will rest in Him Who is my Self. The miracle is therefore a sign of love among equals. 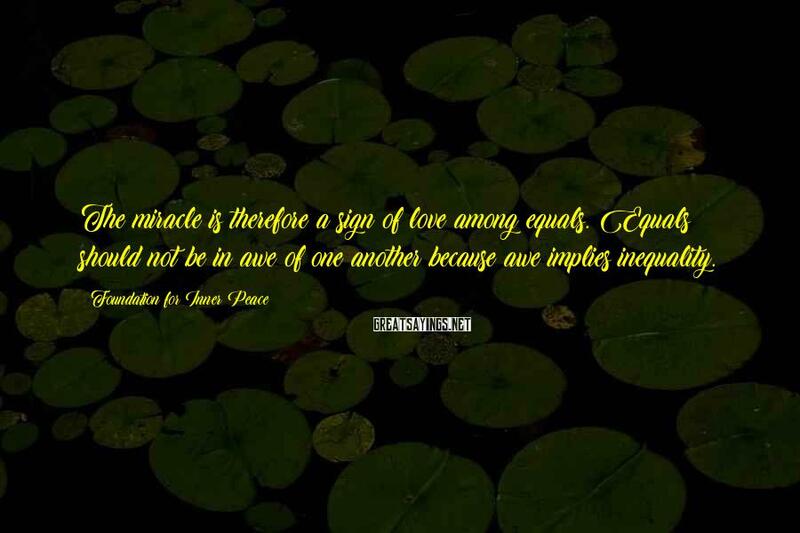 Equals should not be in awe of one another because awe implies inequality. 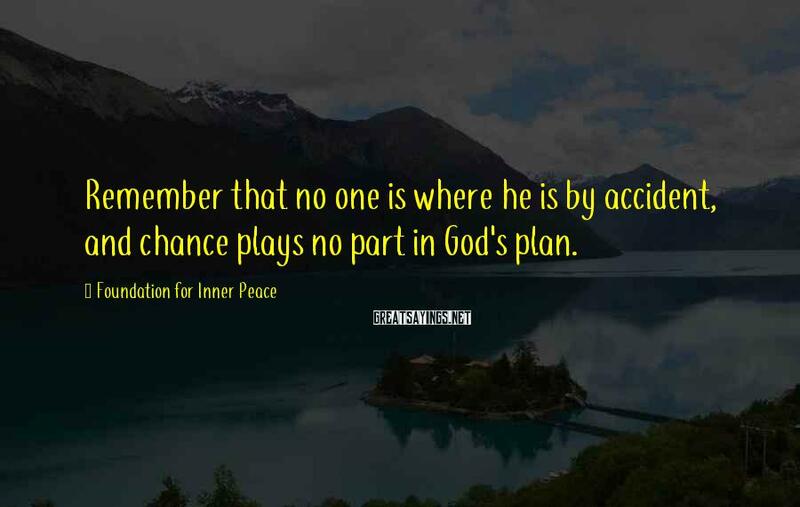 Remember that no one is where he is by accident, and chance plays no part in God's plan. 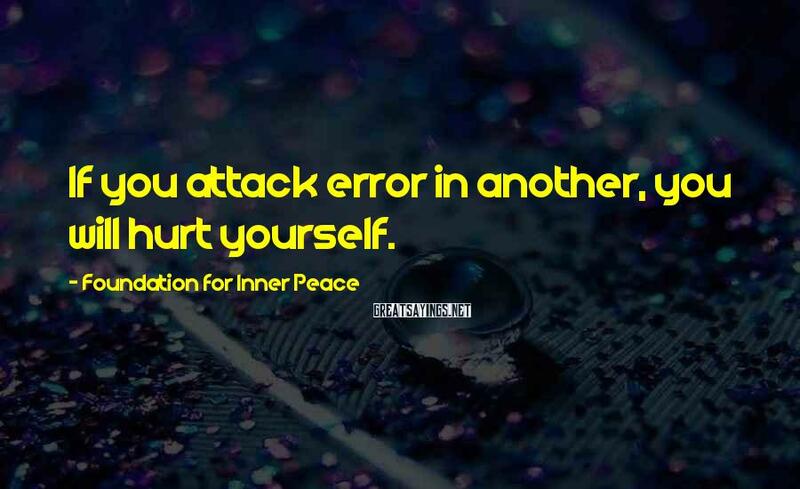 If you attack error in another, you will hurt yourself. T-16.VI.11. 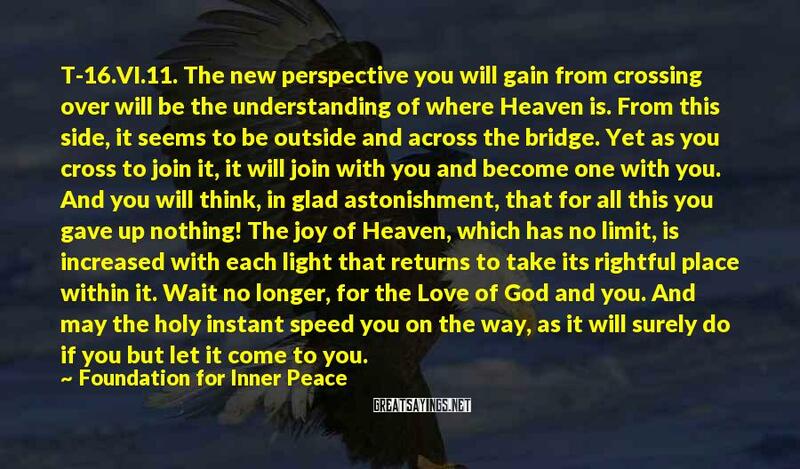 The new perspective you will gain from crossing over will be the understanding of where Heaven is. From this side, it seems to be outside and across the bridge. Yet as you cross to join it, it will join with you and become one with you. And you will think, in glad astonishment, that for all this you gave up nothing! The joy of Heaven, which has no limit, is increased with each light that returns to take its rightful place within it. Wait no longer, for the Love of God and you. And may the holy instant speed you on the way, as it will surely do if you but let it come to you. For no one walks the world in armature but must have terror striking at his heart. 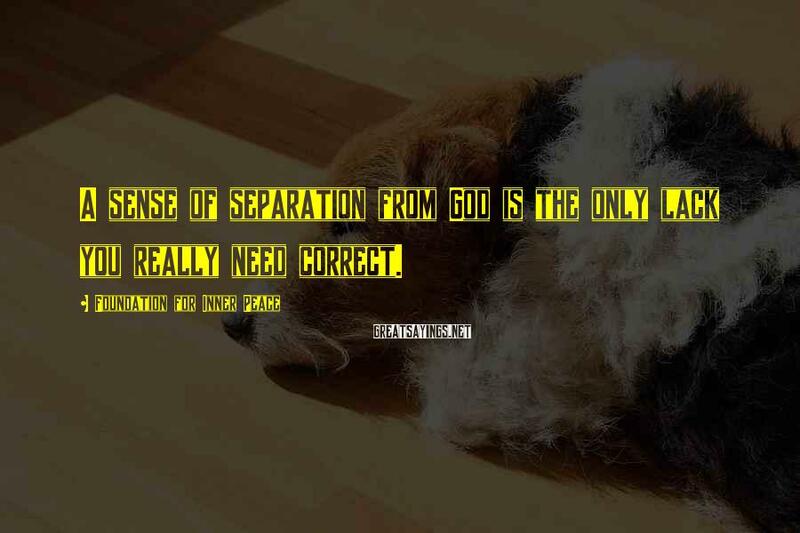 A sense of separation from God is the only lack you really need correct. 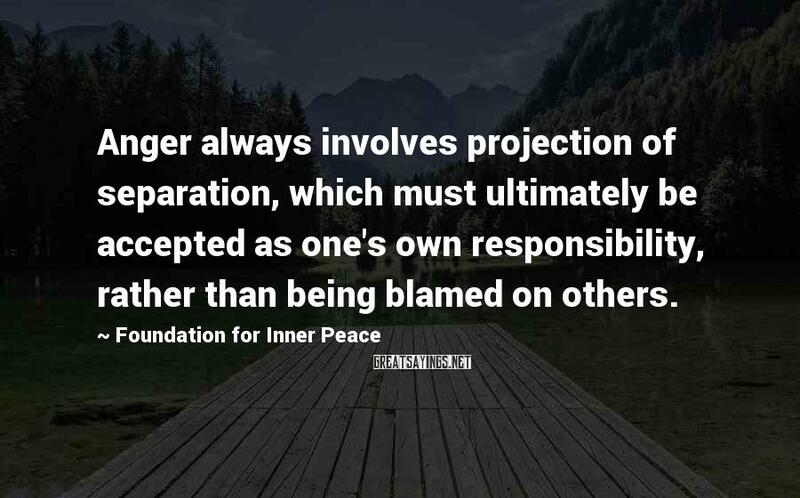 Anger always involves projection of separation, which must ultimately be accepted as one's own responsibility, rather than being blamed on others. Be not afraid. 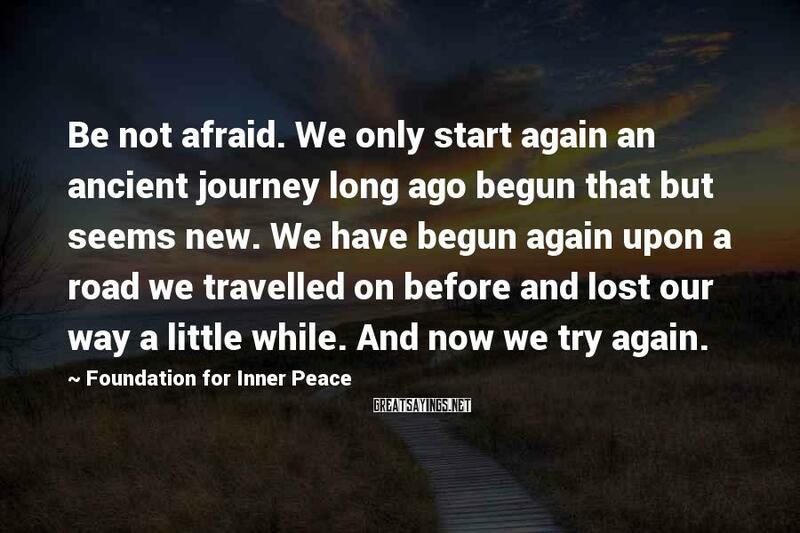 We only start again an ancient journey long ago begun that but seems new. We have begun again upon a road we travelled on before and lost our way a little while. And now we try again. Who can be born again in Christ but him who has forgiven everyone he sees or thinks of or imagines? Who could be set free while he imprisons anyone? A jailer is not free, for he is bound together with his prisoner. He must be sure that he does not escape, and so he spends his time in keeping watch on him. The bars that limit him become the world in which his jailer lives, along with him. And it is on his freedom that the way to liberty depends for both of them. 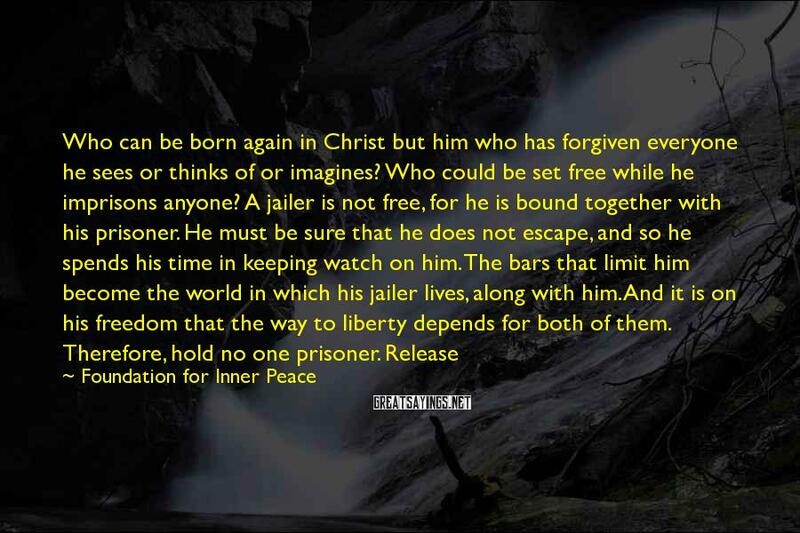 Therefore, hold no one prisoner. Release instead of bind, for thus are you made free. The way is simple. Every time you feel a stab of anger, realize you hold a sword above your head. And it will fall or be averted as you choose to be condemned or free. Thus does each one who seems to tempt you to be angry represent your savior from the prison house of death. And so you owe him thanks instead of pain. 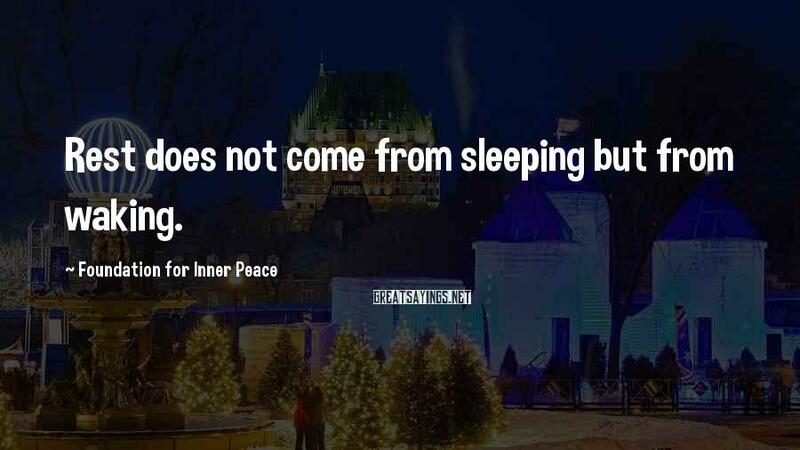 Rest does not come from sleeping but from waking. The emptiness engendered by fear must be replaced by forgiveness. That is what the Bible means by "There is no death," and why I could demonstrate that death does not exist. 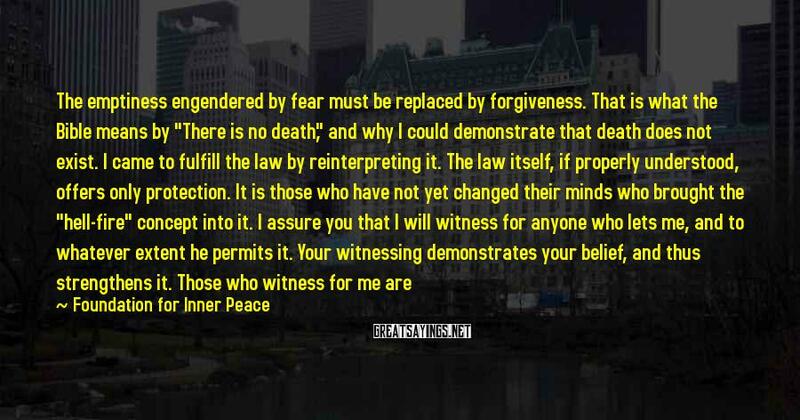 I came to fulfill the law by reinterpreting it. The law itself, if properly understood, offers only protection. It is those who have not yet changed their minds who brought the "hell-fire" concept into it. I assure you that I will witness for anyone who lets me, and to whatever extent he permits it. Your witnessing demonstrates your belief, and thus strengthens it. Those who witness for me are expressing, through their miracles, that they have abandoned the belief in deprivation in favor of the abundance they have learned belongs to them. 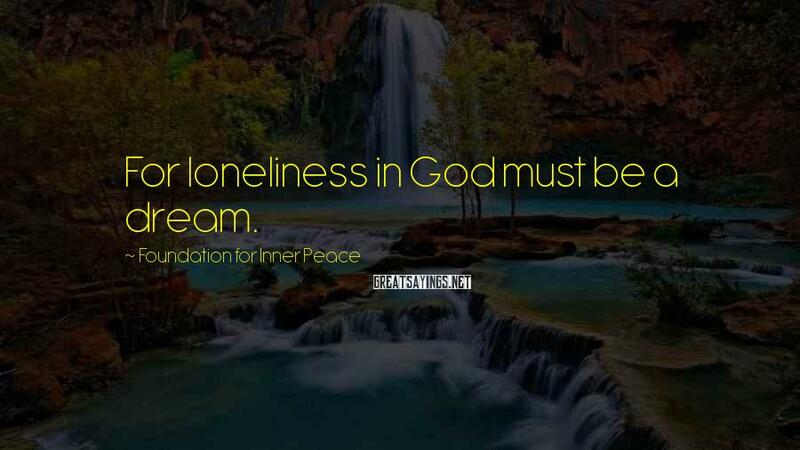 For loneliness in God must be a dream. Miracles are associated with fear only because of the belief that darkness can hide. 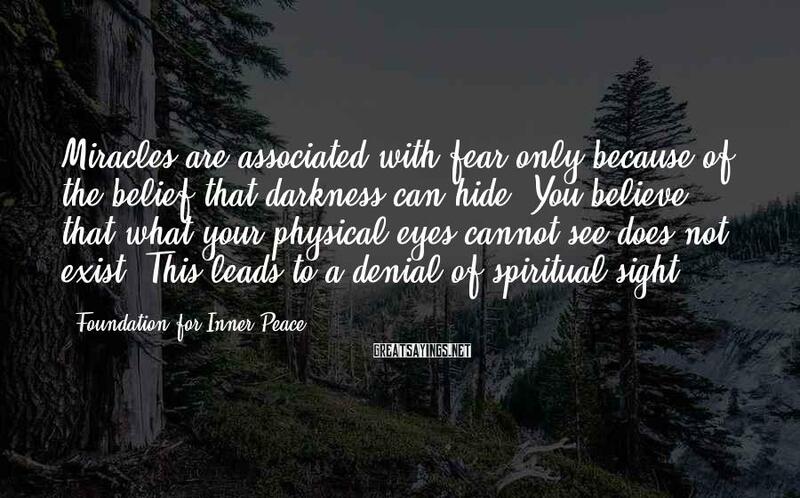 You believe that what your physical eyes cannot see does not exist. This leads to a denial of spiritual sight. 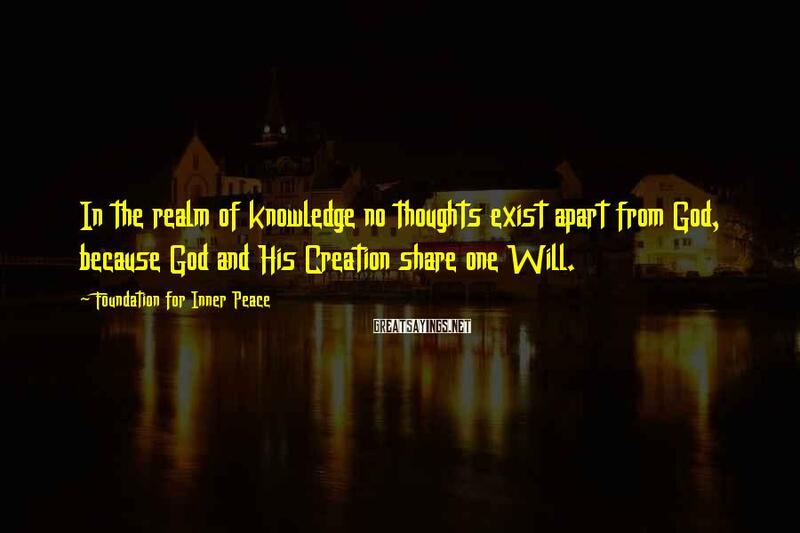 In the realm of knowledge no thoughts exist apart from God, because God and His Creation share one Will. 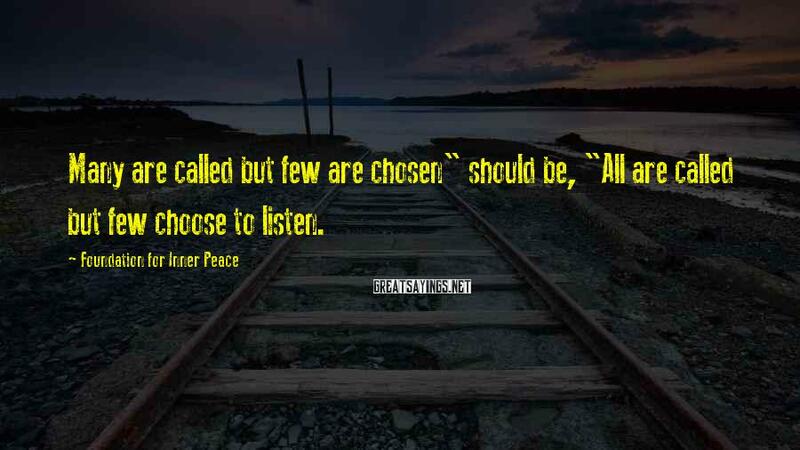 Many are called but few are chosen" should be, "All are called but few choose to listen. 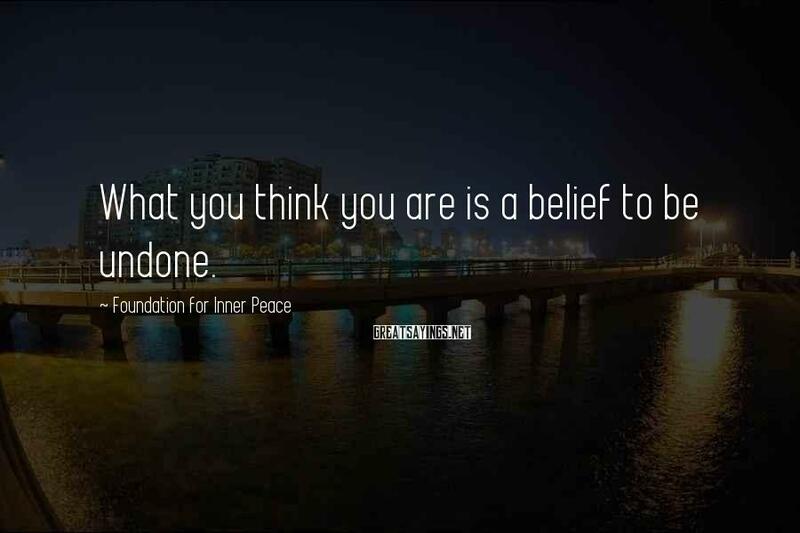 What you think you are is a belief to be undone. unless you fully recognize your complete dependence on God, you cannot know the real power of the Son in his true relationship with the Father. 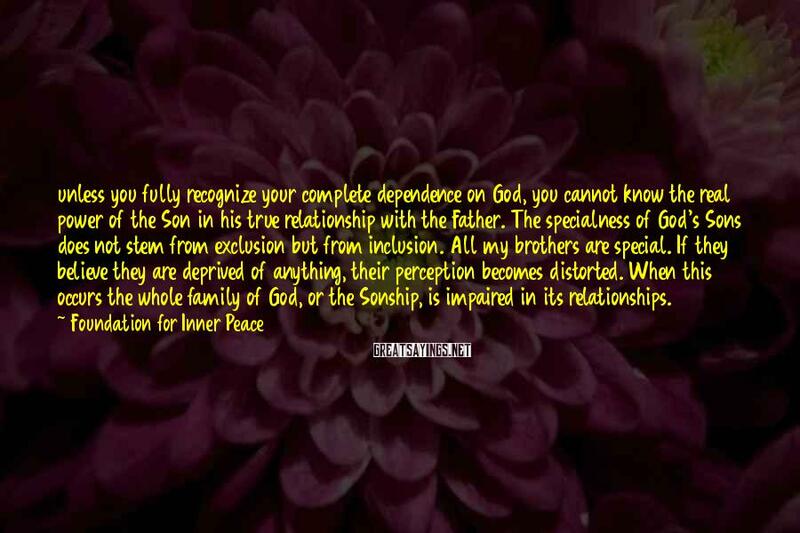 The specialness of God's Sons does not stem from exclusion but from inclusion. All my brothers are special. If they believe they are deprived of anything, their perception becomes distorted. When this occurs the whole family of God, or the Sonship, is impaired in its relationships. Miracles transcend the body. 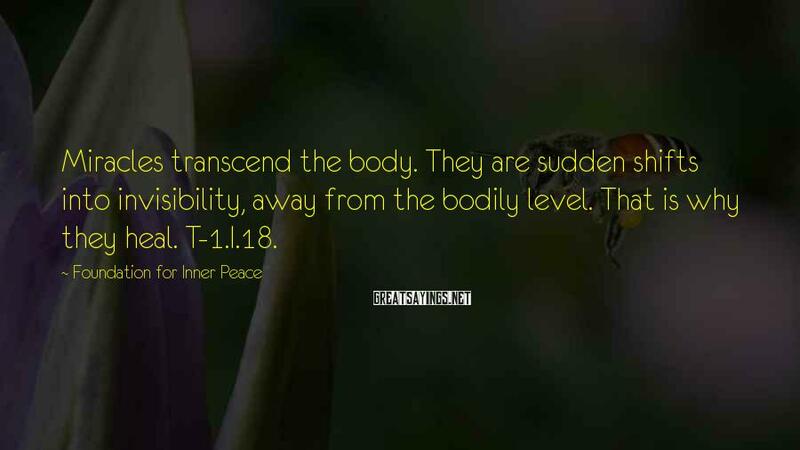 They are sudden shifts into invisibility, away from the bodily level. That is why they heal. T-1.I.18. T-9.III.3. 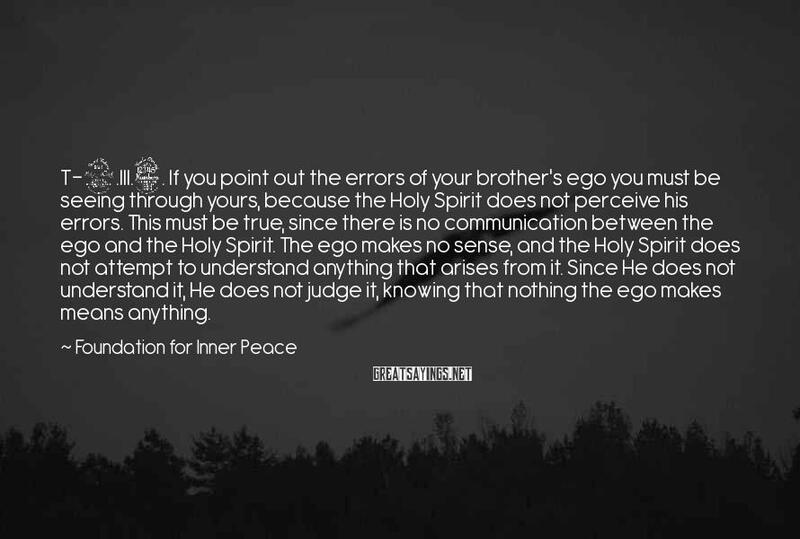 If you point out the errors of your brother's ego you must be seeing through yours, because the Holy Spirit does not perceive his errors. 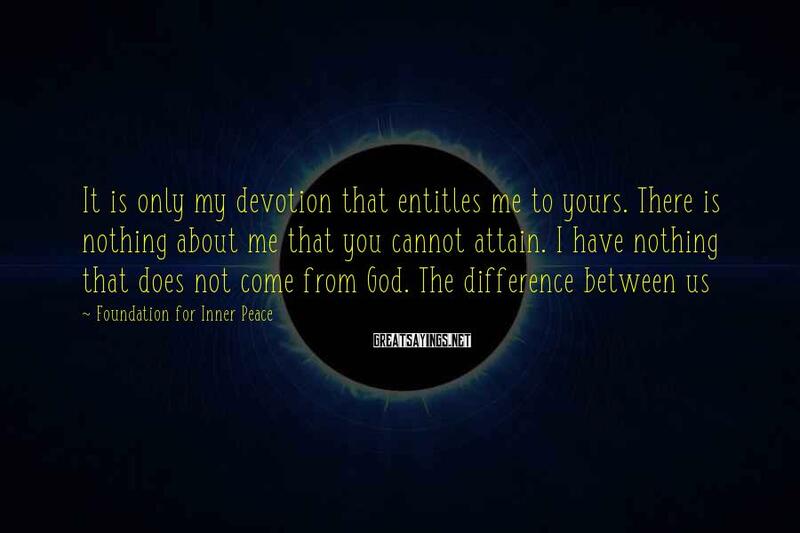 This must be true, since there is no communication between the ego and the Holy Spirit. The ego makes no sense, and the Holy Spirit does not attempt to understand anything that arises from it. Since He does not understand it, He does not judge it, knowing that nothing the ego makes means anything. 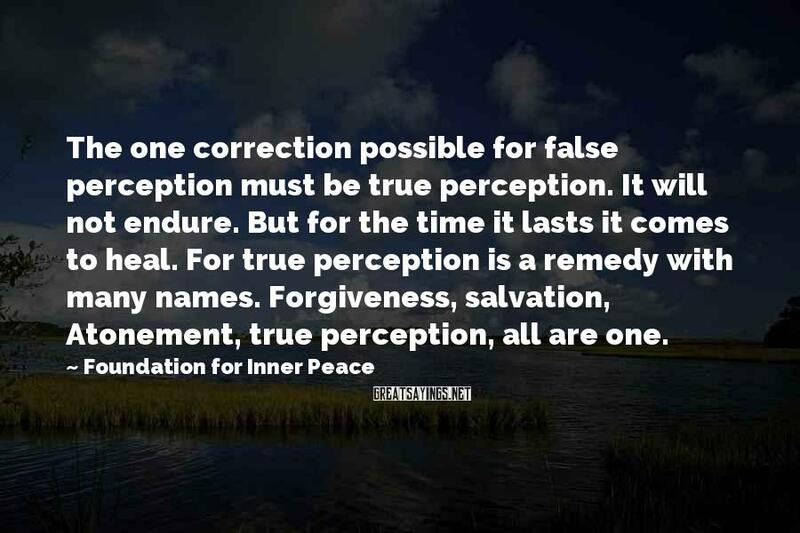 The one correction possible for false perception must be true perception. It will not endure. But for the time it lasts it comes to heal. For true perception is a remedy with many names. 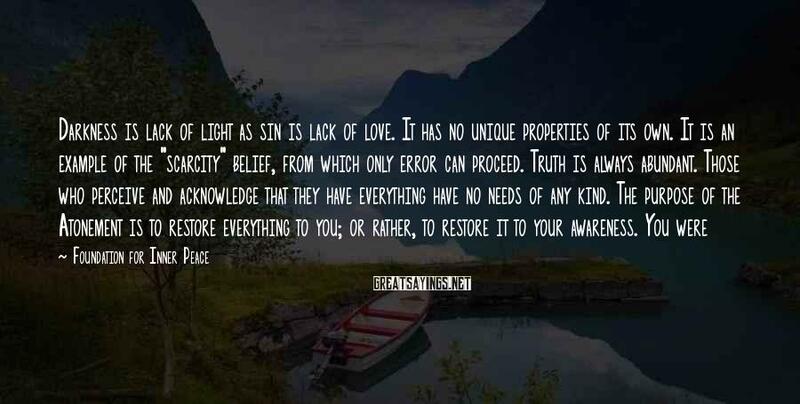 Forgiveness, salvation, Atonement, true perception, all are one. Love knows no bodies, and reaches to everything created like itself. Its total lack of limit is its meaning. 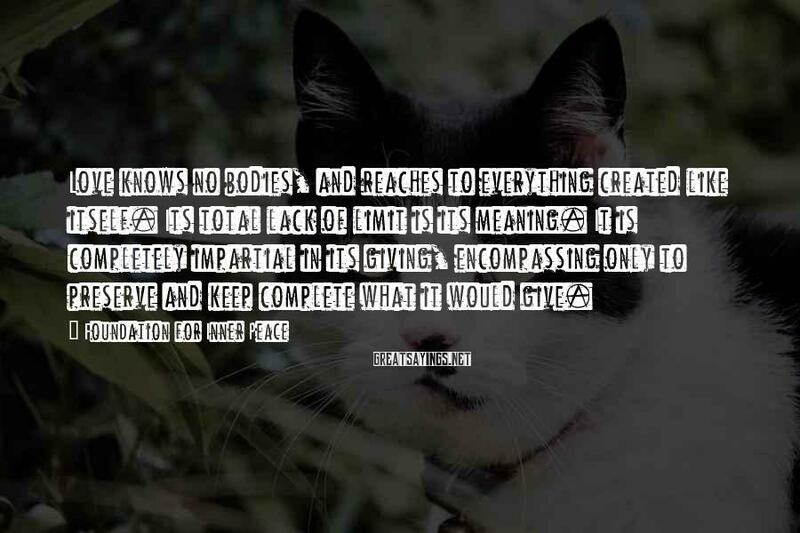 It is completely impartial in its giving, encompassing only to preserve and keep complete what it would give. 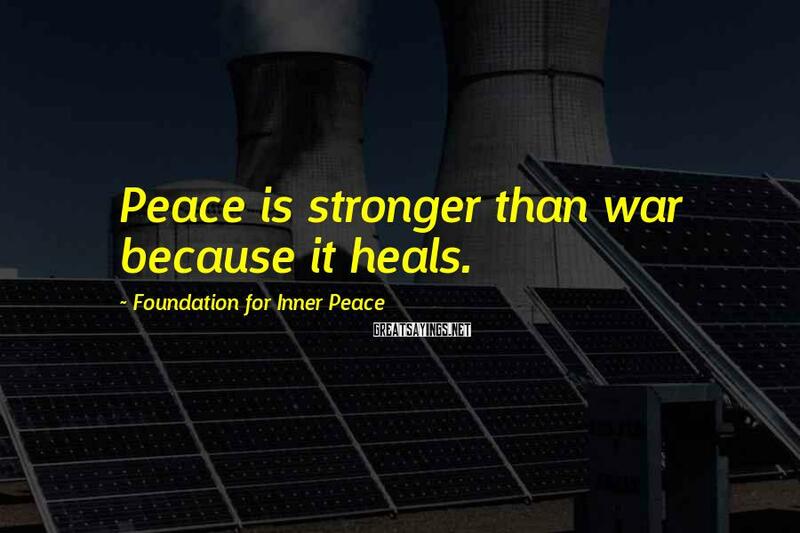 Peace is stronger than war because it heals. 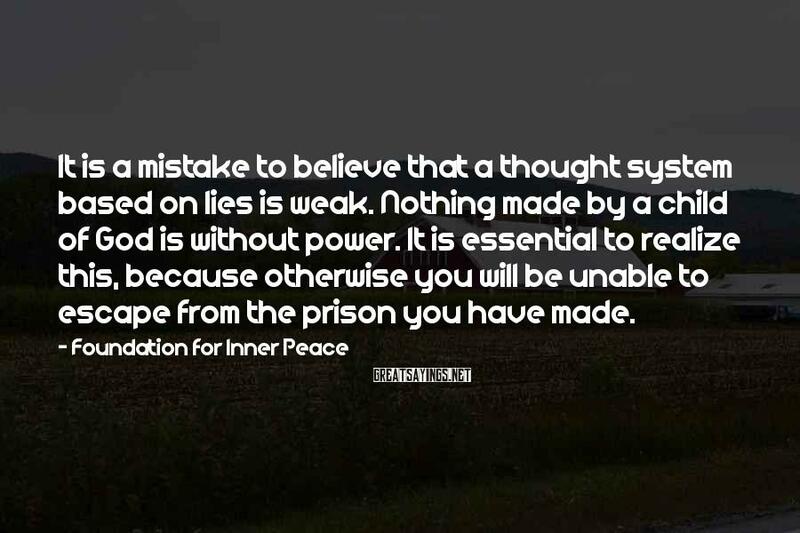 It is a mistake to believe that a thought system based on lies is weak. Nothing made by a child of God is without power. It is essential to realize this, because otherwise you will be unable to escape from the prison you have made. 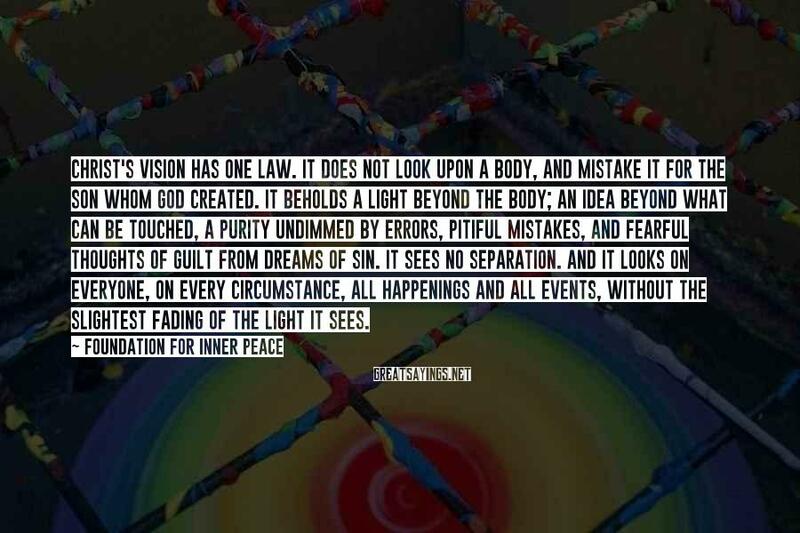 Christ's vision has one law. It does not look upon a body, and mistake it for the Son whom God created. It beholds a light beyond the body; an idea beyond what can be touched, a purity undimmed by errors, pitiful mistakes, and fearful thoughts of guilt from dreams of sin. It sees no separation. And it looks on everyone, on every circumstance, all happenings and all events, without the slightest fading of the light it sees. 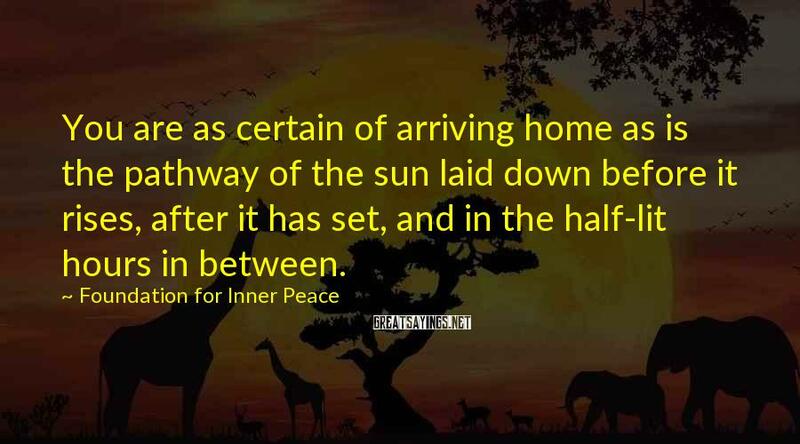 You are as certain of arriving home as is the pathway of the sun laid down before it rises, after it has set, and in the half-lit hours in between. 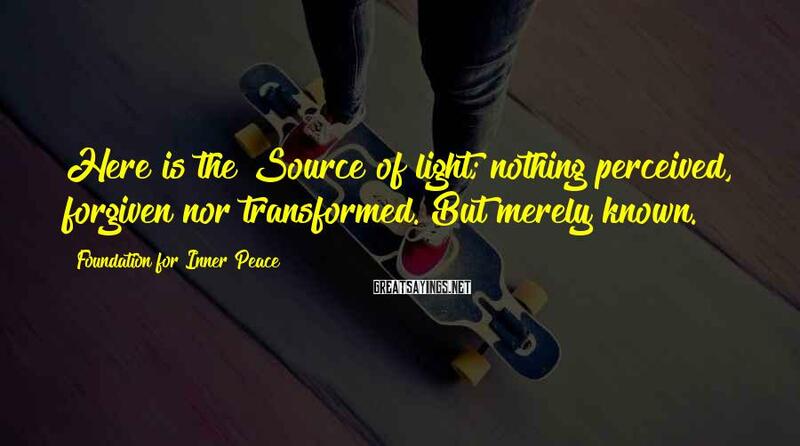 Here is the Source of light; nothing perceived, forgiven nor transformed. But merely known. 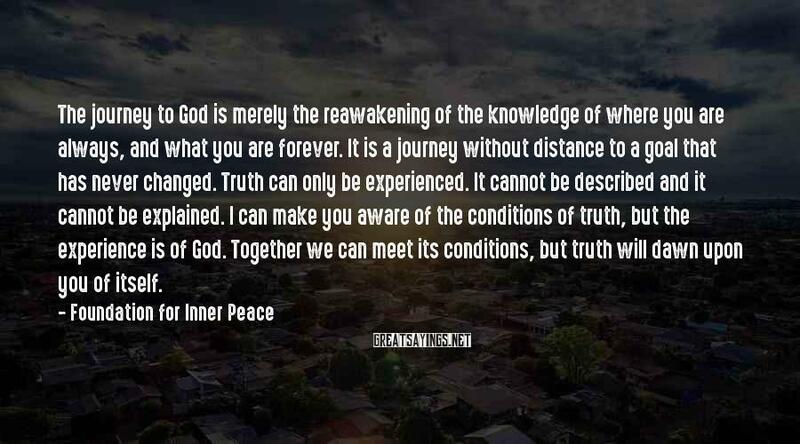 The journey to God is merely the reawakening of the knowledge of where you are always, and what you are forever. It is a journey without distance to a goal that has never changed. Truth can only be experienced. It cannot be described and it cannot be explained. I can make you aware of the conditions of truth, but the experience is of God. Together we can meet its conditions, but truth will dawn upon you of itself. 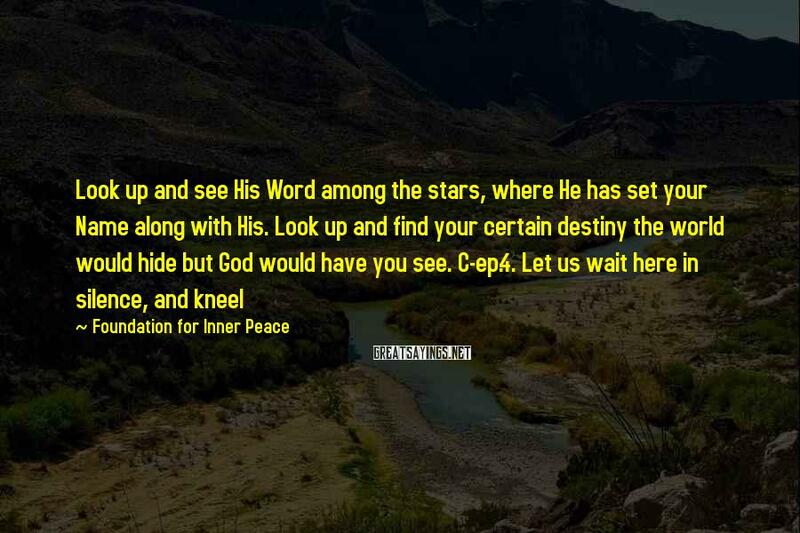 God indeed can be reached directly, for there is no distance between Him and His Son. 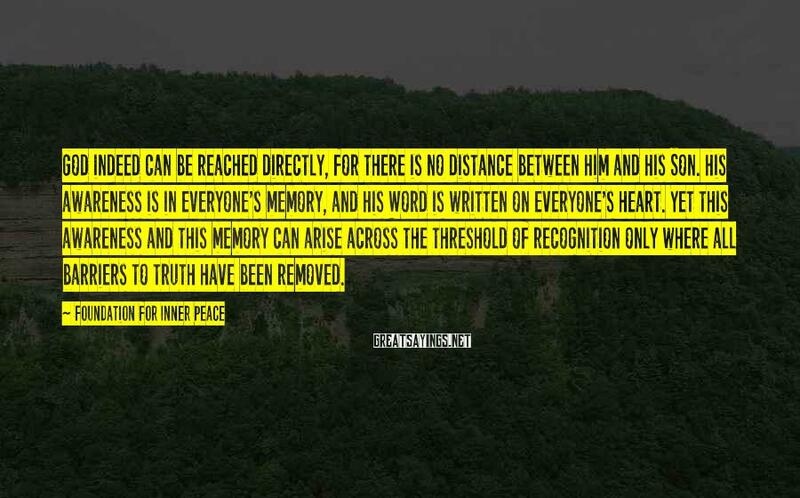 His awareness is in everyone's memory, and His Word is written on everyone's heart. Yet this awareness and this memory can arise across the threshold of recognition only where all barriers to truth have been removed. 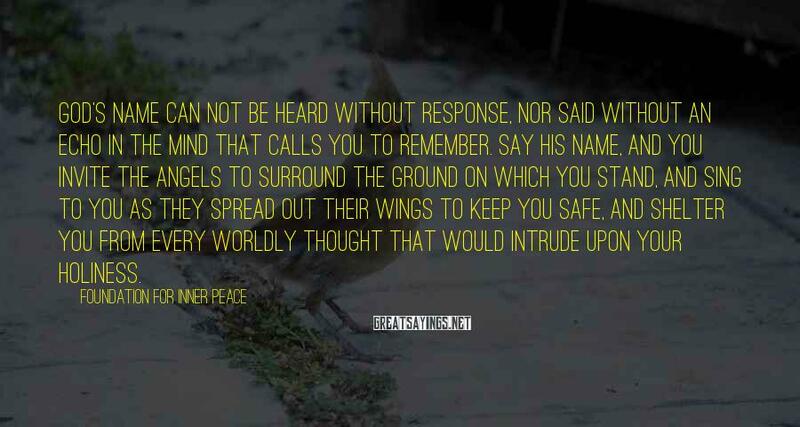 God's Name can not be heard without response, nor said without an echo in the mind that calls you to remember. Say His Name, and you invite the angels to surround the ground on which you stand, and sing to you as they spread out their wings to keep you safe, and shelter you from every worldly thought that would intrude upon your holiness. 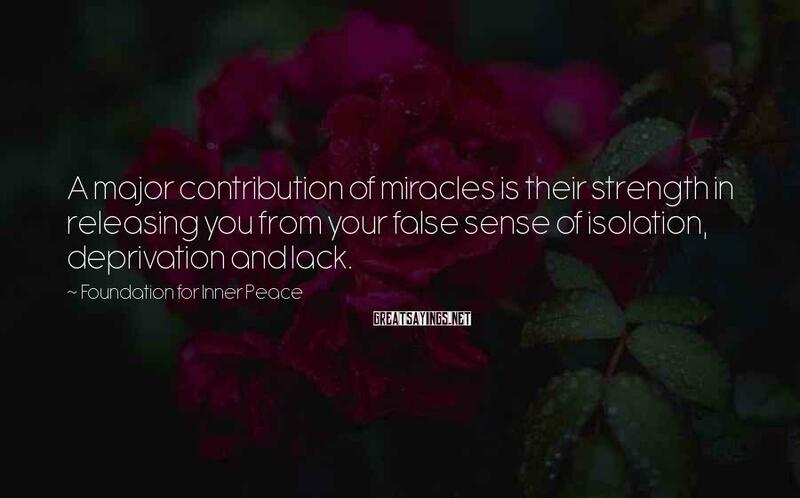 A major contribution of miracles is their strength in releasing you from your false sense of isolation, deprivation and lack. 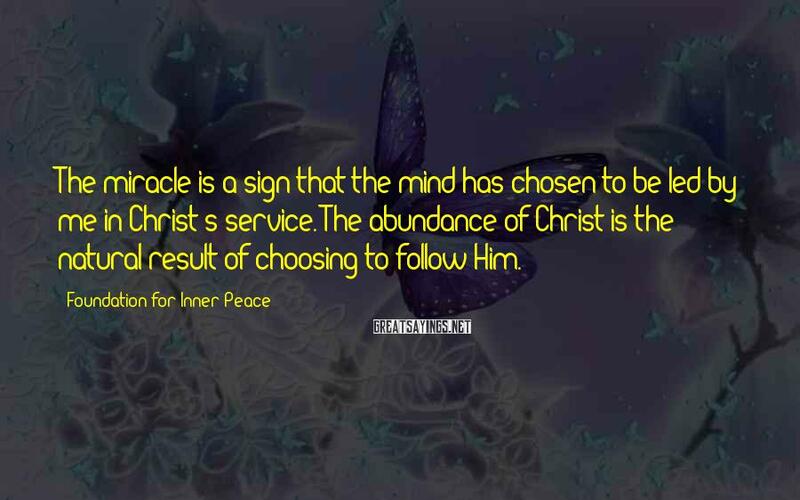 The miracle is a sign that the mind has chosen to be led by me in Christ's service. The abundance of Christ is the natural result of choosing to follow Him. 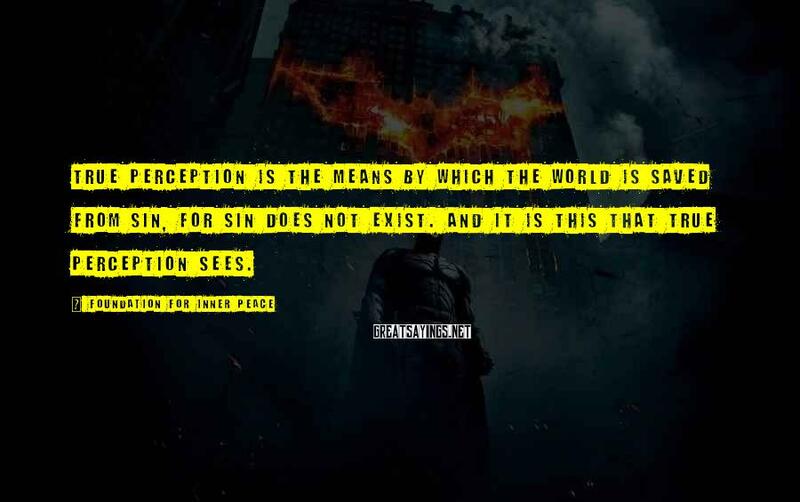 True perception is the means by which the world is saved from sin, for sin does not exist. And it is this that true perception sees. Consciousness is the state that induces action, though it does not inspire it. 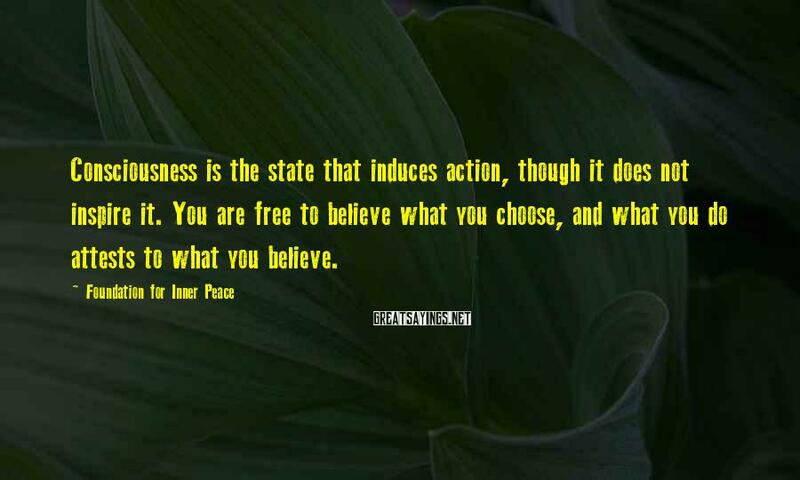 You are free to believe what you choose, and what you do attests to what you believe. Prayer is a way of asking for something. It is the medium of miracles. 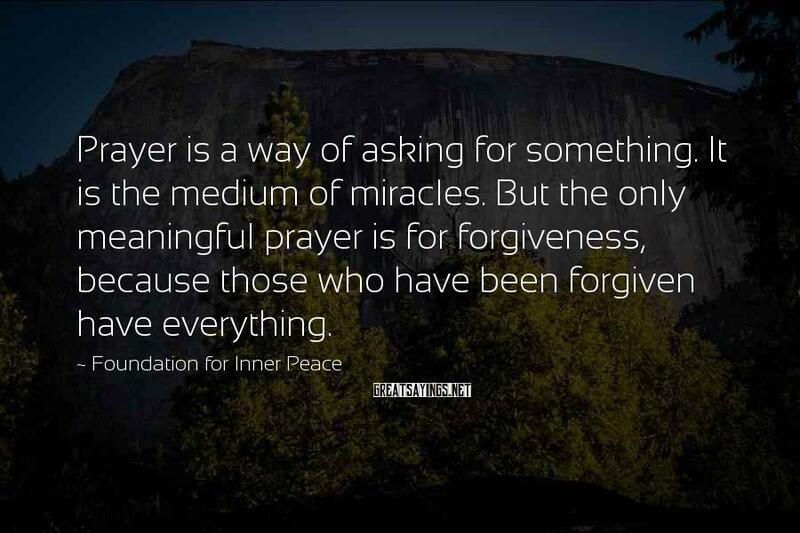 But the only meaningful prayer is for forgiveness, because those who have been forgiven have everything. 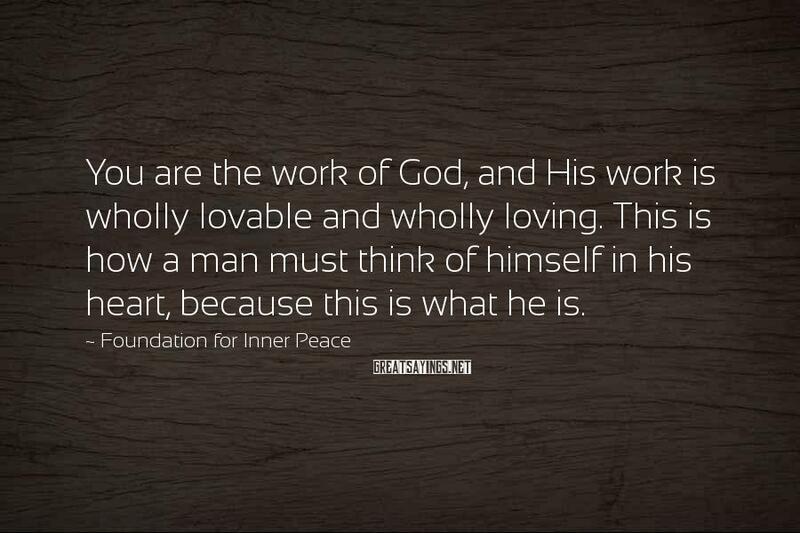 You are the work of God, and His work is wholly lovable and wholly loving. 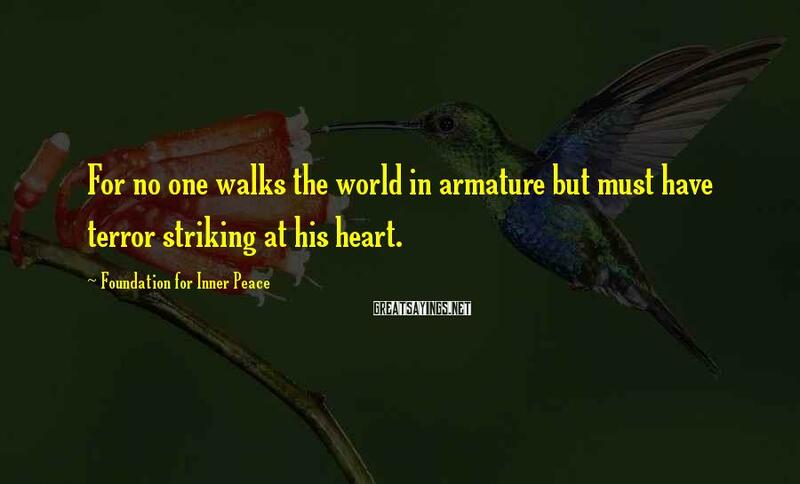 This is how a man must think of himself in his heart, because this is what he is. T-4.II.5. Undermining the ego's thought system must be perceived as painful, even though this is anything but true. 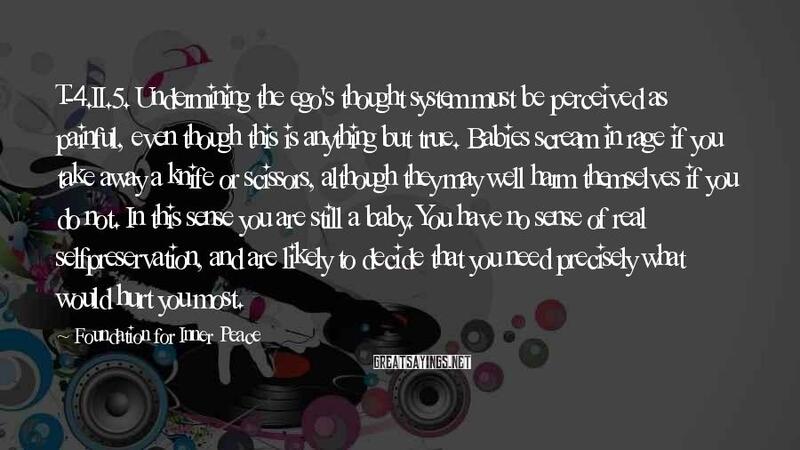 Babies scream in rage if you take away a knife or scissors, although they may well harm themselves if you do not. In this sense you are still a baby. You have no sense of real selfpreservation, and are likely to decide that you need precisely what would hurt you most.